Carbide rotary file is widely used in machinery, automobile, shipbuilding, chemical industry, craft carving and other industrial sectors. 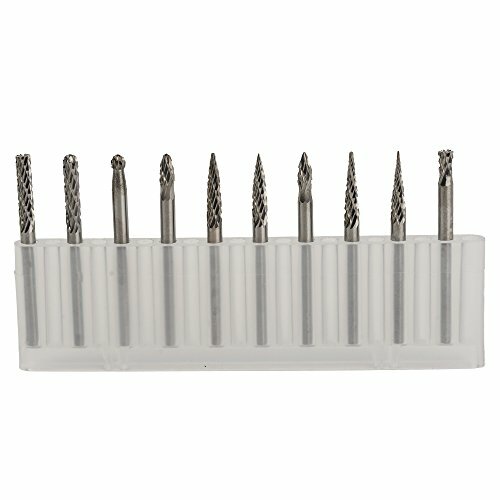 Tungsten burrs can be used for processing cast iron, cast steel, carbon steel, alloy steel, stainless steel, hardened steel, copper and aluminum etc.. Because the carbide rotary file is clamped on the high speed rotating tool for manual control, carbide rotary file pressure and feed rate depends on the tool life and cutting effect. (1) finish all kinds of metal mould cavity, such as shoe mould, etc..
(2) the carving of various metals and nonmetals, the carving of craft gifts. (3) cleaning the casting, forging, welding parts of the flash, burr, weld, such as machine casting plant, shipyard, automobile factory, etc..
(4) all kinds of mechanical parts of the chamfering rounding and groove processing, pipe cleaning, hole surface finishing machinery parts, such as machinery factory, repair factory etc..
(5) the repair of the flow passage of the impeller, such as the automobile engine factory. Work on cast iron, cast steel, carbon steel, alloy steel, stainless steel, copper, aluminum and other metals, and marble, jade, bone and other non-metallic. Processing hardness up to HRA >=85. Replace the small wheel with handle, and no dust pollution.Good quality, high finish. Can produce a variety of high-precision mold cavity shape. High production efficiency. The processing efficiency higher than the manual file, than the small shank grinding wheel increased nearly ten times. Long working life. The durability is ten times higher than that of the high speed steel cutter, which is more than 200 times higher than that of the small grinding wheel. If you have any questions about this product by Eagles, contact us by completing and submitting the form below. If you are looking for a specif part number, please include it with your message.